The Federal Trade Commission Act of 1914 established the Federal Trade Commission. The Act, signed into law by Woodrow Wilson in 1914, outlaws unfair methods of competition and outlaws unfair acts or practices that affect commerce. The inspiration and motivation for this act started in 1890, when the Sherman Act was passed. This era in time was an antitrust movement to prevent manufacturers from joining price-fixing cartels. After the case Northern Securities Co. v. United States, which dismantled a J. P. Morgan company, antitrust enforcement became institutionalized. Soon after, Roosevelt created the Bureau of Corporations, an agency that reported on the economy and businesses in the industry. This agency was the predecessor to the Federal Trade Commission. In 1913, President Wilson expanded on this agency by passing the Federal Trade Commissions Act along with the Clayton Antitrust Act. The Federal Trade Commission Act was designed for business reform. Congress passed this Act with the hopes of protecting consumers against methods of deception in advertisement, forcing the business to be upfront and truthful about items being sold. 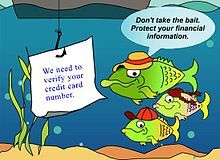 Frame of an animation by the Federal Trade Commission intended to educate citizens about phishing tactics. This act was part of a bigger movement in the early 20th century to use special groups like commissions to regulate and oversee certain forms of business. The Federal Trade Commission Act works in junction with The Sherman Act and The Clayton Act. Any violations of The Sherman Act will also violate the Federal Trade Commission Act so the Federal Trade Commission can act on cases that violate each act. The Federal Trade Commission Act, along with two other antitrust laws, were created for the sole objective to "protect the process of competition for the benefit of consumers, making sure there are strong incentives for businesses to operate efficiently, keep prices down, and keep quality up." These acts are considered the core of antitrust laws and are still very important in today's society. This commission was authorized to issue "cease and desist" orders to large corporations to curb unfair trade practices. In addition, the Federal Trade Commission Act is also considered a measure that protects privacy, as it allows the FTC to penalize companies that violate their own policies through false advertising and other actions that can harm consumers. Some of these unfair methods of competition that were targeted include deceptive advertisements and pricing. It passed the Senate by a 43-5 vote on September 8, 1914; passed the House on September 10, without a tally of yeas and nays, and was signed into law by President Wilson on September 26. ^ a b c d e Winerman, Marc (2003). "The Origins of the FTC: Concentration, Cooperation, Control, and Competition" (PDF). Antitrust Law Journal. 71: 1–97. Retrieved December 6, 2017. ^ "A Brief Overview of the Federal Trade Commission's Investigative and Law Enforcement Authority". Federal Trade Commission. July 2008. Retrieved 18 December 2017. ^ "Federal Trade Commission Act". ftc.gov. ^ "Federal Trade Commission Act". encyclopedia.com. ^ a b c "The Antitrust Laws". ftc.gov. ^ Hutchinson, Eugene E. (2015). "Keeping Your Personal Information Personal: Trouble for the Modern Consumer". Hofstra Law Review. 43 (4): 1149–1173. Full text of current act, from the Legal Information Institute. Pre-Merger Review and Challenges Under the Clayton Act and the Federal Trade Commission Act Congressional Research Service, September 27, 2017.